I had not given much thought to lot size and I now found myself checking out yards in the new subdivisions. I discovered most homes had front yards and little else. I could not help but wonder if the back yards were barren of foliage and needed some help in creating a peaceful retreat. Additionally, folks living next to concrete block walls need relief from the heat they produce. Vines could serve to cool down the outdoor space and bring in some color to the gardens. Vines take up little room, offer food for wildlife or for us, and provide interest with beautiful flowers or fruit. Vines come in annuals and perennials and some of the perennials drop their leaves during winter. Like any plant, do a bit of research on the vines. When you see the terms “aggressive,” or “invasive,” you may wish to avoid these, or, at least ask someone about its performance in the Rio Grande Valley. Some vines can also stain walls and for this reason, I am going to recommend that you put up a sturdy trellis to hold the vines, remove all grass and prepare a planting bed, placing the trellis 2 to 3 feet from the fence and mulch the bed. Be careful not to allow vines too close to the house, especially where they can get under a roof. I recommend you purchase vines from a local, licensed nurseryman, who has experience with their performance in our area, so you can enjoy your new landscaping for many years. Here are some of my favorites. >> Butterfly Vine, Callaeum macroptera, is a fast growing, evergreen vine that provides interest most of the year. It’s bright yellow flowers (blooming now) result in a green, turning tan, butterfly-shaped fruit. This works well on a trellis or arbor and the flowers and fruit can be used in floral arrangements. >> Coral Vine, Antigonon leptopus, has white to pink flowers from mid-summer to frost. They are a favorite plant of bees, so be careful where you place this vine. The pink flowers form in delicate looking bunches, but this is a hardy vine that disappears during winter and returns in late spring. If the soils are too rich, you get lots of vegetative growth with few flowers. So, no fertilizer, please. In areas with more rainfall, it can become invasive, but this is rarely the case here. 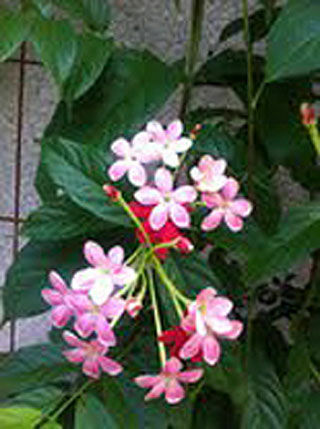 >> Rangoon Creeper, Quisqualis indica, is an evergreen, tropical vine with bright green leaves, fragrant white flower spikes that turn red in the afternoon. It needs plenty of space. This plant can climb palm trees, reaching up to 70 feet, so control it with a trellis. Performs best with morning sun and some afternoon shade. Water weekly during periods of drought and mulch. >> Passion Flower Vines, Passiflora spp. We have several Passion Flower species native to South Texas with white, light blue or purple flowers. The caterpillar of the Gulf fritillary will feed on the leaves. Leave them, as they are food for baby birds. Some Passiflora species have large flowers. Besides purchasing at local nurseries, look for these plants at Birding Centers, across south Texas, and Valley Nature Center. While planning your vine designs, don’t forget cucumbers, small melons, gourds, and grapes all produce fruit on beautiful vines. You can pick up a vegetable planting guide from 9 a.m. to noon Saturday at the Growing Growers Farmers Market at Firemen’s Park on the corner of 1st Street and Business 83 in McAllen.